We are HVAC and electrical contractors for residential and commercial clients. 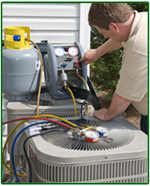 Summit supplies heating, air conditioning and electrical products while maintaining extensive repair and installation services. Our technicians can repair any brand of product. If you need to replace your furnace or air conditioner Summit can provide you with a top of the line product at a reasonable price. We can also save you money by repairing your existing system. If you need electrical wiring, or lighting installation, give us a call today for your FREE ESTIMATE. Please contact us at: (704) 597-0940 to schedule your next electrical, heating or cooling service. Summit Air & Electric serves in and around the communities of Charlotte, Huntersville, Waxhaw, Concord, and Harrisburg, North Carolina. In addition we cover in and around Tega Cay, York, Fort Mill and Indian Land, South Carolina.